Fully decked out in Christmas lights, Chao Phraya casts a warm glow onto the snowy street outside even though the holiday season has long passed. Hurrying inside to escape the cold on a Thursday night, we were seated almost immediately in arguably the best seats of the house. We were a party of three sitting right by the front window looking out onto Laurier street. Normally, this spot might be a little drafty, being closer to the less insulated glass windows and in close proximity to the entrance, but the thoughtful arrangement of the heavy velvet curtains in the foyer prevented the chill from getting in. The heaters around us helped too. Towards the back, there is a slight upper level. The area surrounding the stairs are decorated with pieces of beautiful Thai artworks, placed on varying shelf levels. My fellow diners had visited Thailand, Cambodia and Vietnam a few months ago and were eager to relive some of the culinary experiences they had there. This was a chance to taste a little bit of South-East Asia at home. After hearing Twitter buzz about this place over a couple of months, we were primed and ready to try the place out. Our waiter knew the menu well and didn’t mince words when it came to asking his suggestions for the restaurant’s best dishes. 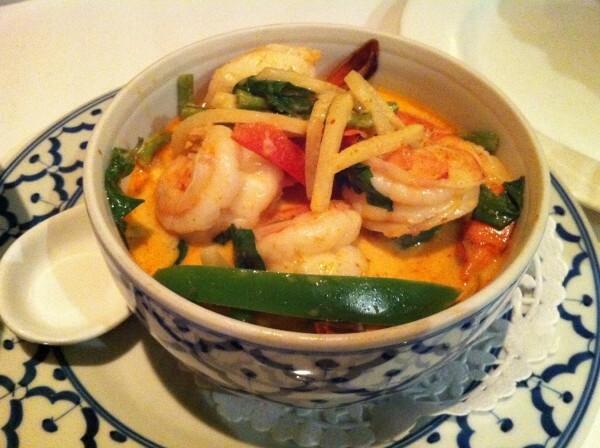 Without hesitation he threw his weight behind any red curry dish offered on the menu, claiming that they were all good. We took his word for it and ordered with his recommendations in mind. We started off with tom kah gai and tom kah talay, both hot and sour soups with the same base of coconut and lemongrass the former with chicken and the latter with a combination of different seafoods. These came to us in white bowls tessellated with deep blue asymmetric designs capped with a insulating top with a matching aesthetic. I want a whole set of these bowls for my home! The taste of the soups were phenomenal – I would go back and order that in a meal sized portion. Truly delicious. The one complaint we had as a group was that the temperature of the soup wasn’t hot enough. It was warm yes, but not hot. That’s the one thing we would have changed about the dish. Apart from that, like I said, great soup. The shrimp in red curry and sweet basil leaves, sauteed eggplant with shrimps and scallops in spicy sauce with basil and roasted boneless duck sauteed in garlic and black pepper all came at once along with three bowls of steamed white rice. We shared everything. Shrimps were good – basking in that red curry sauce that the chefs at Chao Phraya have obviously perfected, you can’t really go wrong. The eggplants were good but for me, a little oily. We didn’t expect it to have that much shrimp so overall this entire meal ended up being more shrimp heavy than we had planned. No big, but it just wasn’t obvious by looking at the menu that we had ordered so much shrimp. The duck was my favorite of the mains. It was tender with a little bit of elasticity in each bite and it was cooked to perfection. Paired with some simple spices that didn’t overpower the protein but instead let it shine, we ended up saving some of this dish and taking it to go for someone who we knew would love it even more than we did already. 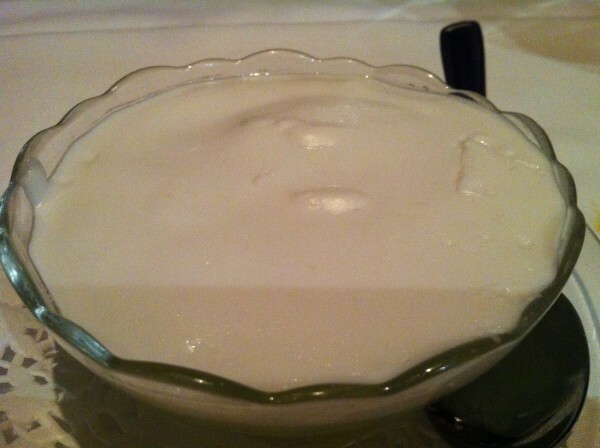 Our meal capped off with three orders of Thai tapioca pudding which was served hot, to our surprise. Coming in a palm sized shallow bowl, the green tapioca mixed with sliced pieces of coconut flesh was covered with a light layer of coconut foam. Needless to say, we finished them off in no time at all. 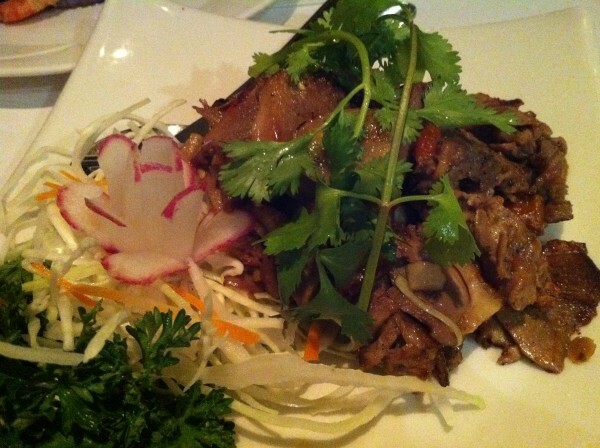 Exceeding my fellow diners worldly expectations, this place has zoomed to the top of our list in terms of go-to places in Montreal for authentic Thai food. Tags: Black Pepper, Boneless, Chao Phraya, Coconut, Coconut Milk, Dinner, Duck, Eggplant, forkandtell, Garlic, Laurier, Lemongrass, Montreal, Peppers, Red Curry, Scallop, Shrimp, Squid, Tapioca, Thai, Thailand, Tom Yum.